Terry Rhodes ’78, senior associate dean for fine arts and humanities since 2012, has been appointed interim dean of the College of Arts and Sciences, effective immediately. She takes the post held by Kevin M. Guskiewicz before he became interim chancellor on Feb. 5. A former chair of the music department, Rhodes has extensive experience in research in the humanities as well as teaching in her 32 years at Carolina. She is currently principal investigator on the Humanities for the Public Good initiative from the Mellon Foundation, which seeks to bridge the silos between academic research, teaching and the communities they serve. She also was co-principal on the Carolina Digital Humanities Initiative, also funded by Mellon, which created partnerships and programs that promote innovation, interdisciplinary connections and collaboration around digital teaching, research and outreach in the arts and humanities. Rhodes led the steering committee for the Carolina’s Human Heart: Living the Arts and Humanities yearlong celebration in the 2016-17 academic year. That effort showcased the role that the arts, humanities and qualitative social sciences play in helping address the major issues. 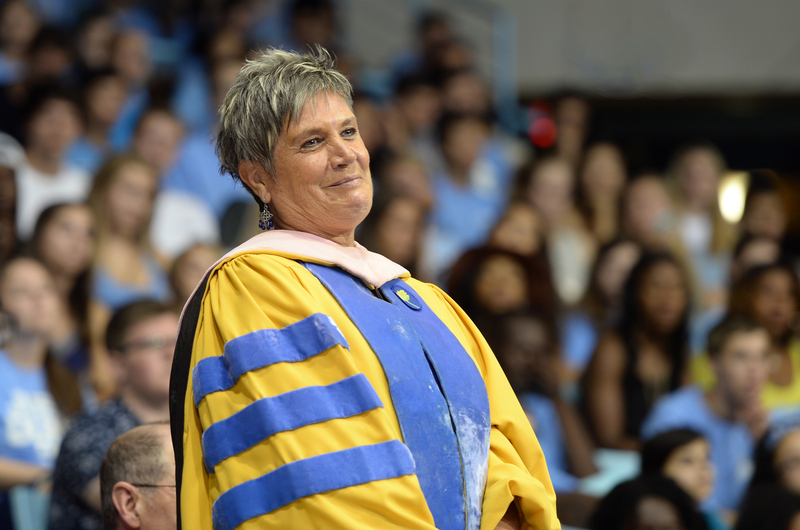 As interim dean, Rhodes will oversee the largest academic unit at Carolina with nearly 17,000 undergraduate students and 2,500 graduate students, and more than 70 academic departments, curricula, programs, centers and institutes. She has served the University in a variety of roles, including as a member of the voice faculty, director of UNC Opera and faculty marshal and as the faculty representative on the GAA Board of Directors (2012-13).